The Michael Clegg Memorial Birdrace took place during the day. The Scarborough team came out on top of the 17 participating teams within Yorkshire, not only on most species recorded (a very respectable 107 particularly given the weather and the 3rd highest total for us on this birdrace!!) but on beating our average of 98 by 9. 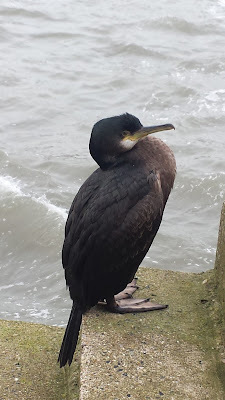 Highlights during the day were the 3 Black-necked Grebe in the Harbour where two Shag, clearly exhausted given the rough conditions showed well. A Goshawk was seen over Hilla Green but unfortunately only seen by one member! Wykeham South Lake was very productive with drake Pintail, 17 Shoveler, a Dunlin over and 3 European White-fronted Geese among the usual suspects. A Grey Plover over Hutton Buscel Carr was a remarkable record, probably better than the 4 Tundra Bean Geese that headed over there too! Four Jack Snipe and a Snipe were flushed from Taylor Way while Cayton Carr produced some valuable ticks highlighted by 9 European White-fronted Geese south! The juvenile Whooper Swan was at the Mere, Long Nab failed to produce much other than a dead Jack Snipe. The two Dark-bellied Brent Geese had relocated to Scalby Lodge Pond, an Eider and a Little Gull were in Jackson's Bay, 730 Wigeon were at Scalby Mills where 25 Wigeon, 2 Teal and a Shoveler flew south. A sea-watch from Marine Drive produced 13 Common Scoter, Great Northern Diver and 3 Little Gull south. The final highlight was a Chiffchaff at Folkton sewage works.